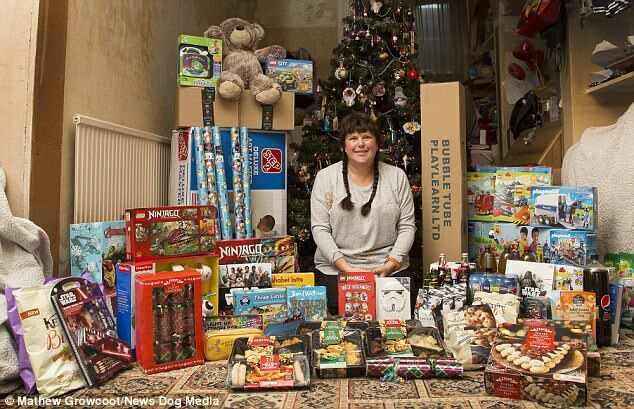 Home Amazing Savvy mother-of-three spends just £20 on a luxury Christmas worth £2,000 with the help of ‘extreme couponing’ and cashback deals (and her bargains include food, drinks and LOTS of presents) . 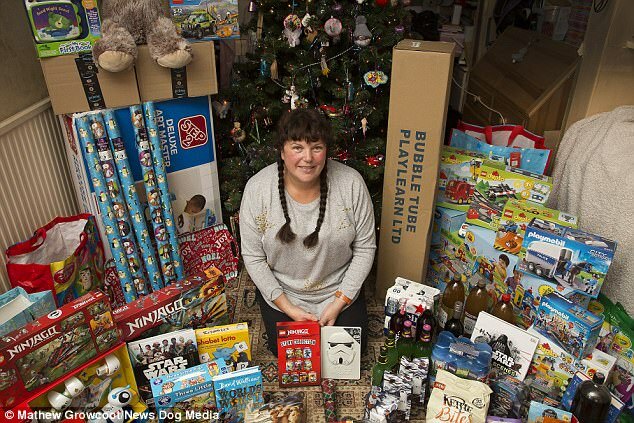 Savvy mother-of-three spends just £20 on a luxury Christmas worth £2,000 with the help of ‘extreme couponing’ and cashback deals (and her bargains include food, drinks and LOTS of presents) . 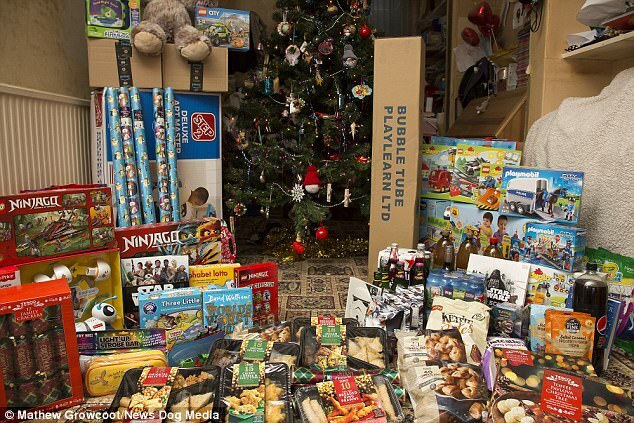 The average British family will fork out an estimated £1,150 this Christmas. But one savvy mother-of-three has spent just £20 on the big day including everything from presents to cards, decorations and her family's entire Christmas dinner with drinks. 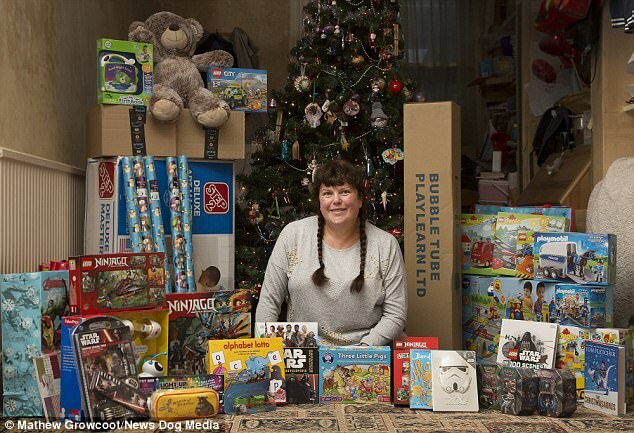 Aimee Moore, 43, from Scarborough, has spent the tiny sum on a luxury Christmas for her family - but has got £2,000 worth of food, booze, and presents including the latest children's toys after taking advantage of coupons and cashback deals throughout the year. Self-styled 'coupon queen' Aimee has spent the last year building up her festive haul - using special offers and amassing thousands of pounds' worth of free cashback to give her family the ultimate Christmas. Aimee - who is mother to sons Isaac, nine, Dexter, seven and Bertie, two - said: 'Christmas used to be a very stressful time of the year for me. 'In the run-up to the big day, I would be worrying about how I could afford everything. And by Boxing Day, I would be fretting about my card bills. 'But now with couponing and cashback apps, everything from the must-have Christmas toy to the turkey on the table costs me next to nothing. 'So now when I see my kids' faces light up as they open their presents or as they enjoy their lovely festive meal, I feel proud. 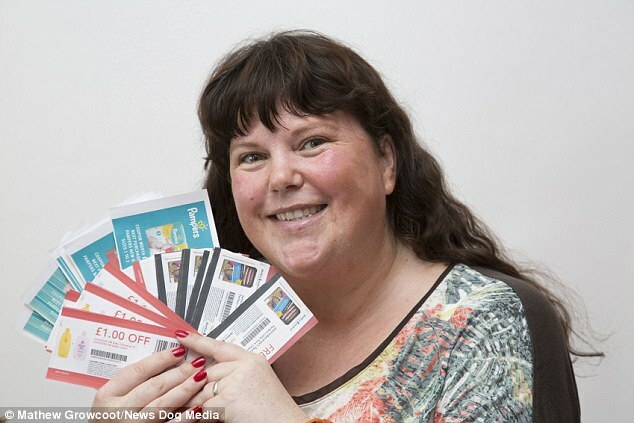 The mother-of-three makes huge savings on her festive spending by sourcing special offers throughout the year, using coupons to get free products to save for Christmas Day and amassing cashback on apps which she uses to buy everything from gifts to food for the whole family. All bought in the January sales when everything is easily discounted by 75 per cent off or more. A mixture of Tesco Clubcard coupons which Aimee has amassed throughout the year and free products from apps such as Greenjinn, Checkout Smart and Shopmium and sometimes free samples/coupons on websites such as approvedfood.co.uk. All children's gifts and toys bought on amazon with vouchers amassed from cashback apps such as MobileXpression, Receipt Hog and Shopprize UK. Aimee also uses the extra money cashback she has left over on TopCashback and Quidco towards children's gifts if she needs to. Aimee got the Lynx gift sets and Cadbury chocolate boxes from a mixture of collected Tesco Clubcard points and coupons for free products (e.g. apps like Shopmium and websites such as supersavvyme.co.uk and caringeveryday.co.uk). She bought the Soap & Glory giftsets from Boots advantage points saved up throughout the year. Again Aimee gets coupons to buy free products from Boots (e.g. baby food) when she shops there and still gets extra advantage points on these products even though they’re free. Aimee also gets cashback on apps when she buys products from Boots e.g. TopCashback. These techniques have helped Aimee to get a staggering £1,960.57 worth of Christmas items for just twenty quid. Aimee explains: 'I start planning for the festive period in January. If you make the time to do so, you can buy things like luxury Christmas crackers and wrapping paper for virtually pennies. 'As well as looking for offers and checking prices throughout the year, I also use coupons which offer products like wine and even champagne for free. And I'll save these under the stairs or in the attic ready for December. 'But perhaps my biggest trick is cashback apps, which give you money back whilst you shop. 'I use a variety of different apps on my phone - some like Shopmium and Greenjinn which offer cashback in money, and others like Topcashback, MobileXpression and quidco that provide it in the form of Amazon or Tesco vouchers. 'Whilst I use the money from cashback apps on various household things during the year, I save up my cashback vouchers so I can spend them on my Christmas shopping. 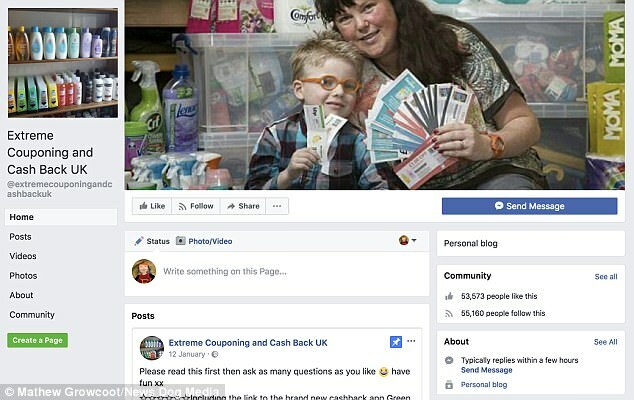 Aimee started couponing in 2013 and has become an online celebrity thanks to her ingenious money-saving tips - with her Facebook page 'Extreme Couponing and Cash Back UK' clocking up over 55,000 followers in under two years. 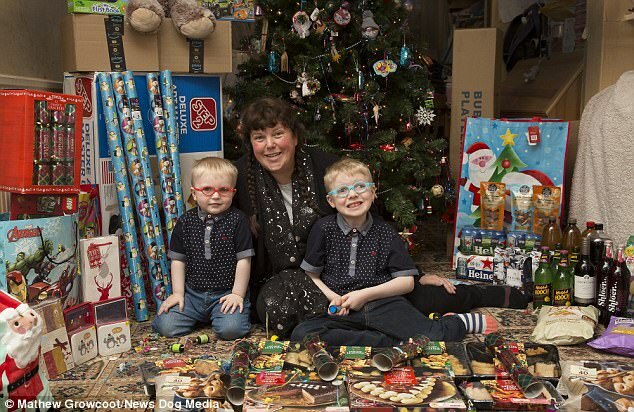 Aimee, who was able to quit her job as a warehouse supervisor to become a full-time mum to her sons through 'extreme couponing', said: 'Three and a half years ago, we were skint and struggling as a family. 'But through couponing and cashback, I've been able to save thousands on our bills per year and eventually I was able to become a stay-at-home mum to my kids. 'I was getting lots of messages from friends asking me how I was saving money so it seemed easier to just put all my money-saving tips in one place. 'I was shocked and pleasantly surprised when I started racking up thousands of followers on my Facebook page every month with my couponing advice! 'Couponing and cashback is definitely my passion and I love helping others get a bargain too. 'It really is so easy to save money as long as you follow a few simple tricks and it's also very rewarding. You can buy items like wrapping paper and cards for pennies as well as find super-discounted toys for kids' stocking fillers in the clearance sales. The more you plan, the more you will save! And stock up on any free booze and party snacks that will keep for the festive period. Remember to store them in a safe place ready for December so you don't end up drinking that free bottle of wine on a random Saturday night! You can run several apps on your phone at the same time and remember, every little cashback amount counts. Everything adds up in the course of the year and 50p today can be £100 come December. ... and keep an eye on offers throughout the year so you can get that must-have present at the best price.